Description: The organ case was built in 1684 by Mateo de Lago, a joiner from Frechilla. It is constructed of pine. 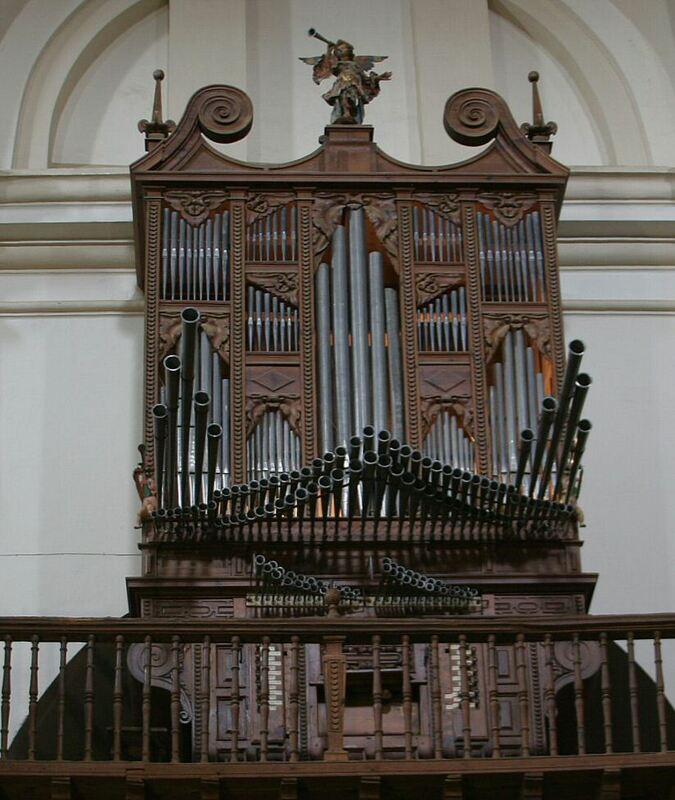 Between 1687 and 1691, Juan García, an organist and organ-builder also from Frechilla, built an instrument of which the fluework survives unaltered in the present organ. This instrument had one divided keyboard of 42 notes, with a short bottom octave. In 1718, the Cascabeles (bells) with their accompanying angels were added. In 1730, the gallery on which the organ now stands was built high up on the north side of the church, near the west end. The organ was moved to the gallery by Antonio Rodríguez Carvajal from Sahagún. He added three notes to the treble of each register, giving the instrument its present compass of 45 notes with a short bottom octave. He also added three new stops, namely the Címbala, the Corneta and the vertical Trompeta Real which stands at the back of the case. He also added the Pájaros (nightingale), two sets of Tambores (drums, each consisting of two pipes so as to produce a dissonant rolling effect). Finally, he added the angel and trumpet still to be seen at the top of the case. In 1788, the organ was enlarged and restored by Antonio and Tomás Ruiz Martinez, organ-builders from Torquemada. They were also responsible for building the largest instrument in the province of Palencia (organ at Amusco dating from 1786-7) and also the largest in the neighbouring province of Valladolid (organ at La Seca dating from 1792). The Frechilla organ was provided with new bellows, in which four feeder bellows, driven by a single handle, feed a large multi-fold diagonal bellows. This is still in working order. He also replaced the wind trunk, soundboards, stop action, suspended tracker action, and keyboard. The latter is of boxwood. To bring the organ into line with the fashion of the day, he added the six half-registers of chamade reeds. The organ was cleaned and the bellows repaired in 1832, 1886 and 1911. By the end of the early 1950’s, it had become silent. In 1980, a programme of repair was started on the organ by the French organ builder Daniel Birouste and the organist Francis Chapelet. The bellows were repaired, the organ was again cleaned, and a small number of missing pipes replaced in the trebles of the Lleno and the Címbala. The bass of the vertical Trompeta real, which had also disappeared, was renewed. Otherwise the organ retains its original pipework dating from 1691, 1730 and 1788, together with the 1788 wind system, soundboards and action, which remains light, responsive, and relatively quiet. The organ was fully operational again by 1983, complete with an electric blower which feeds the diagonal bellows, but the instrument remains fundamentally in its 1788 condition in that since then it has never been fully dismantled. The combination of largely seventeenth-century fluework, eighteenth-century reeds of the highest quality complete with original shallots and tongues, and the superb acoustic of the tall church, produces a sound of great magic. The organ was recorded in August 2005 with 48 kHz, 24 bit, multi-channel for Hauptwerk 3, using the multi-release technique introduced by OrganArt. The stops were recorded with multiple release levels for short and long key attacks for optimal acoustical mapping.